It’s because “Make a second copy to” is designed to store a second copy of your originals in a logical place, which means you’re safe to go and reformat / re-use your flash cards. What it’s not designed to be is your real, permanent backup. The problem here is wishful thinking! People see the words “second copy” and eagerly imagine “backup”. But that’s just not its purpose. To repeat, it’s there to ensure the user has a second copy of the originals and can safely re-use the media cards – not replicate whatever folder and filenaming the user happens to choose upon import. That may be jarring, but if it were to try to replicate the import it simply wouldn’t satisfy a few very common practices. For instance, many users rename photos after reviewing them in Library/Develop and deciding which they want to keep, or other users move images to different folders or rename folders. So any 1:1 correspondence with the import copies is so easily broken that it’s not at all stupid to use “Imported on YYMMDD” – which has the simple virtue of being factual. So it’s best to understand what this “Make a second copy to” feature does, and not read something else into it. Use it for new imports, but don’t expect it to be more than a temporary safeguard. Once these new files have been picked up by your proper backup routine, you can then safely delete the Imported On folder. Thank you for this. Now I better understand the reason of DDMMYY better. You can’t. It is intended to be a temporary copy of the flash card. John: The points you make are fair enough, but it would be better, I think, to allow the possibility for user choice. I use the ‘second copy’ facility to create an archive copy of the untouched images which get backed up, as do all my files on a daily basis. I want the folder names to mimic the first copy folders – at present I hand change them which is not elegant. 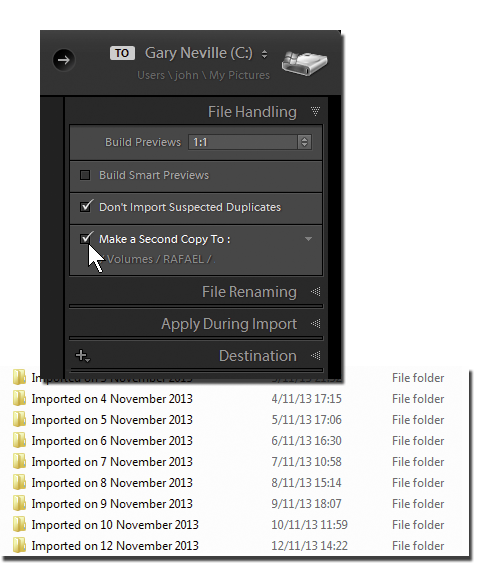 The second copy archive contains CR2 files, whereas the first copy versions are DNG – the file names are designed to allow easy matching as, when and if required. That’s perhaps what I mean by wishful thinking, Anthony, and I don’t dispute that it’s an obvious way to understand the second copy. If LR really did provide an image backup feature, I’d prefer it to be much more robust. John: I think this is actually part of a larger issue with Lightroom, where much attention has been made to the development (pun) of the Develop section, but the Library section could do with a serious dose of development too. I wouldn’t dispute that, Anthony, not for a moment.